Stuart at Early Warning has a post on the flat production profile of the major international oil companies - Oil Production of the Top Three IOCs. The [graph] shows the liquids production of the three largest international oil companies (IOCs), as compiled from their annual reports. 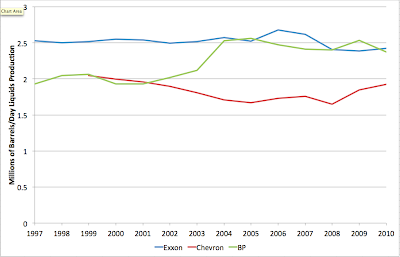 You can see that by and large these companies are about the same size they were 15 years ago, in oil production terms (the partial exception is BP which managed to buy into a Russian oil company half way through the last decade). The big IOCs have not been able to increase production much in response to the high prices of the last six or seven years. It's important to note of course that since the 1980s most oil is not produced by IOCs but rather by the various national oil companies. Also it's worth noting that IOC revenues and profits have grown enormously over the last 15 years as oil prices have increased so much - they are basically selling roughly the same sized stream of liquids for far more money.